•	Post-operative and post-traumatic edema. •	Primary and secondary stage lymphedema. 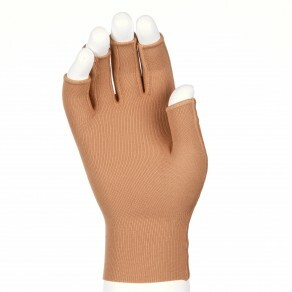 •	Hand piece reduces accumulation of fluid in the hand while wearing a medical compression sleeve. •	Innovative fabric with effective containment. •	Ellipses in the crease of the elbow and on the point of the elbow for extra comfort. •	Comfortable top band holds securely. •	Machine wash gentle cycle at 100° F and cool tumble dry. •	Natural moisturizing properties of Lanolin.